I just loaded up ACR for the first time since February 2015 and the software was updated. I am getting a security alert on the site's certificate: The name on the security certificate is invalid or does not match the name of the site. The certificate is issued to: *.dbpn.com. I asked a "Live Help" rep about it and he said "no idea". Maybe the link on the login page could be changed to "Live Rep" or "Live Bait" or "Live Free". Also, can you please let me know what type of Windows are you using? Not true my friend, is not a secret that there have always been players trying to abuse of the kindness of our promotions. This does not only happens with Americas Cardroom, but to big sites including Stars. However, we are highly confident of our security system and we currently have a monitoring area that is constantly looking into all the tables and tournaments finding collusion or fraud. 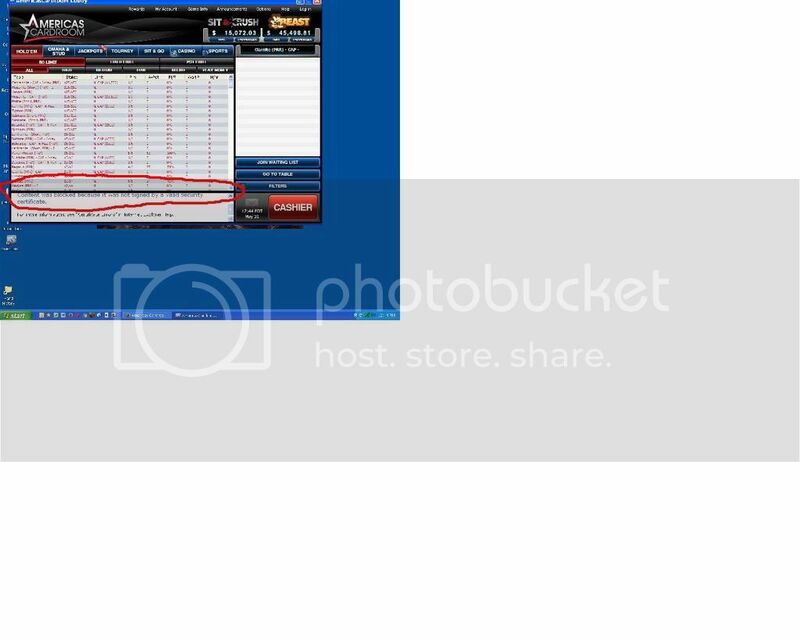 Also our security system is the most sophisticated in the online poker community and if a player tried to use this kind of software in our tables. If you want to report a player with suspicious behavior you can send your report to Security@AmericasCardroom.eu in order to check on the player(s) to ensure the fairness of the games you played. Uninstalled and reinstalled with link provided. Same security alert on certificate. After I say no to the security alert, the bottom left panel of the lobby displays: Content was blocked because it was not signed by a valid security certificate. Right, so if you read the thread you also note the resolution correct? As I mentioned before buddy and on the forum, bots system is not allow in Americas Cardroom and all the reports we received were already reviewed and actions were already taken. We have checked your case with our IT Team and they informed us that this situation can arise with users of Windows XP. The reason you cannot accept the Security Certificate is since Windows XP was issued a while ago, it doesn’t properly read certificates we use from our main servers and hosts. Please note that this only occurs on Windows XP systems. Also, there is no security issue in the sense of their being a problem, just a problem with this Operative System which cannot properly read new implementations of the SSL certificates. We suggest you use a different computer which does not use Windows XP or that you update your Windows version on your current computer. This will help you properly run with updated certificates and allow you to access the game. We hope this information is useful; please let us know if there is anything else we can do for you. A 100% Reload Bonus and a $240,000 GTD Sunday Special are set to Go Off! On July 3rd at 3pm ET we are more than doubling the guarantee on our $215 buy-in Sunday major! Players start with a 10,000 chip count. Check out our satellite schedule including a 50-seat Mega Satellite! 100% Reload Bonus up to $240! We will have some scheduled Casino, Sports and Cashier maintenance tomorrow from 1am to 9am ET. We apologize for any inconvenience. "Freedom is a gift, given to us by our freedom fighters. They had to struggle to win Independence and sacrificed their whole lives so that we could live in a free country. Let their sacrifice not go in vain. Let us promise to work hard towards making America a better nation each day free from corruption and violence. Happy Independence day to all my brothers and sisters." On behalf of all of us here at &#8234;AmericasCardroom&#8236; have a safe and happy 4th of July. It was an idyllic July 4th weekend here. The weather was warm, yet not hot. The wind was cool, but not cold. The crowds were large, yet not too large. The food and drink were awesome. I hope you, too, had a great 4th of July weekend. We will have a raffle tonight at 7pm ET in our Twitter and Facebook page, participate for a free $215 seat to the Sunday Special tournament at 3:00pm ET! Americas Cardroom gave me no strings attached $5 cash the other day. I grew that little $5 into over $10 in a couple of days by playing $0.01/$0.02 ring games (NL & PLO), $2 Jackpot SnGs (NL & PLO), and Blackjack. The micro-stakes field is filled predominantly with US players, which reminds me of the good-old days before Black Friday. I am glad to hear that Tony! • 100% bonus on the first deposit up to $1,000. • Up to four entries to the $250 new depositors freeroll. • Between $2 and $6 jackpot tourney bucks will be rewarded every day for 20 days from the date of the first deposit. Americas Cardroom is by far my most favorite place to play online poker at the moment. have to admit that all this hype about americas cardroom and the unique propositions it's offering to it's players (don't ask what) makes me hop onto this thread nd input some characters with my keyboard just to be part of this mega hype that's taking over the world. Beware of the groups running bot farms and factories from Eastern European countries where the cost of living is cheap and grinding micros 15+ hours a day can be a very lucrative form of business when the site does not take a strong stance on botting.